I had a little surprise when I stopped by the garden today. It kinda' helped me to think of something for a May Challenge. Here's my final picture for April. 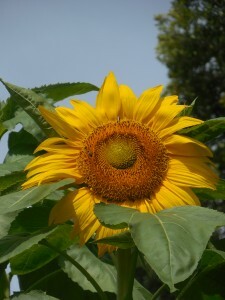 My first sunflower in the garden. Me too. The flower is about a foot across and the stalks are at least eight feet tall. My students keep asking what they are as they grew taller and taller. I guess they had never seen big sunflowers before. I thought I remembered there was someone who wasn't crazy about sunflowers. I was just so happy that one had finally opened and the squirrels hadn't ruined them so...perfect moment. It is a perfect sunflower for sure! Here it's the birds that eat the seeds. I'm glad it wasn't ruined yet. I'm sure the birds have a go at them too.